July 4, 2013 - by Paul Farol - 6 Comments. “It’s fact of Filipino life that you never really know when or if you’re going to arrive at your destination after leaving the house.” — Said by some random stranger inside an MRT coach. Before getting into the DoTC’s recently completed World Bank funded (WB)-funded Philippine Transit Information Service (PTIS), I think it would be best to describe how it is like for an average Filipino to travel around Metro Manila. To see things more clearly, one has to disabuse oneself of the notion that the country has a public transportation system in the true sense. The key word here is “system”, which is defined as group of interacting, interrelated, or interdependent elements forming a complex whole. What we have are various modes of transportation (airports, seaports, LRT/MRT systems, buses, jeeps, garage to terminal AUVs, tricycles, and pedicabs) servicing various routes that operate independently from one another. In certain cases these modes of public transport even compete with one another on the same route. Just looking at EDSA, you’ll find the MRT/LRT system plying the same route as several bus companies and hundreds/thousands of jeepney operators. Then, at many junctures, you’ll even find tricycles and pedicabs sharing the same road as buses and jeeps. And, to make EDSA even more cramped, a lane has been designated for motorcycles right in the middle of the major highway — not that motorcycles feel obliged to stay in that lane at all and not illegally split-lane. And let’s not even get into the fact that buses and jeepneys have made almost every point on EDSA their own bus/jeepney stop. Calling this chaotic bag of modes of transport a system is a bad joke. For Metro Manila to have a public transport system, it should perhaps be like the LRT/MRT. These days, the MRT/LRT systems hardly resembles what it was designed to be. A few days ago, a friend and former officemate at HUDCC who rides the MRT to and from work everyday complained about just how crowded the coaches are these days. Back when Lisa and I were still working at the same office around 2003, we’d usually ride the MRT together and back then, the coaches were already crowded. So, her recent complaint about how crowded the MRT is these days boggled my imagination — how much more crowded can it be? I kidded her (and I probably shouldn’t have knowing exactly the kind of torture she probably goes through) and said that perhaps a number of unwanted pregnancies in the country actually happened while riding an MRT coach. The joke as an allusion to the fact that back then, people were already crammed so tightly in every available space on the coach that if it got anymore crowded people would start fusing together or the coach would bust at the joints. Believe it or not, riding a crowded MRT coach is actually the good part because at least people know they’re finally on their way somewhere. For most MRT commuters, the suffering starts with bearing the long line for a tickets. One wonders how come the MRT management hasn’t thought of finding a way to eliminate or reduce the lines, like, for instance issuing tickets that people can “load” money into just like a debit card or issuing month long trip passes. Then comes the long wait for a coach with space in it. If standing in line to buy a ticket was bad, standing on a crowded platform is even worse. It gets so hot and muggy that you’ll swear you’re in a sauna — for which we can probably thank some bureaucrat or government official who probably thought that some kind of air cooling system on the platform would be unnecessary in a tropical country. The seemingly interminable wait for a coach with some space in it can last anywhere from 10 minutes to an hour or more. Then, by the time you actually get into a train, you’re already so sweaty and hot headed that someone stepping on your foot or someone elbowing you might set you off. And there were actually several times that I saw a fight break out in a crowded MRT coach and this was years ago. And, can you imagine what it would be like if the coach’s air cooling system conks out? 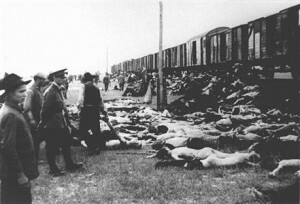 I don’t want to make light of what people actually felt on a Holocaust death train, but riding an MRT train may seem close to what they experienced. Next Article Filipinas or Pilipinas? What is in a name? Monorail can be put almost anywhere since most of the structure can be fabricated off site. It is very efficient. Less expense and durable even in earthquakes. It is raised so no worries about flooding. Runs on electricity so it can use the LRT power system. Seems like a good idea, but where do you propose to put it? Would we replace one of our existing rail transits, or do we make room for another one (the monorail)? Replace the existing. @vince great thing about monorail is the small footprint so you can put it down spaces that light rail can never go. Yes, replace all rail, train are 19th century tech and needs to be phased out for people movers, the monorail has all its components integrated into the rail itself. Subway it so expensive and with the flooding problems in the Philippines all I see is a disaster in waiting. Think of how much it cost to lay rail lines from one city to the next and then think of using that money to improve or build airports. Aircraft are more reliable and you can handle traffic from multiple locations. I hold that LRT-2 along Aurora Blvd. is better. Tickets issued through machines, big coaches, generally better. Wonder why they won’t change the ticketing system for the MRT and LRT-1 and have bigger trains. Also, MRT stations were made to house 4-coach trains, but they only use 3 coaches per train. It was a badly-run thing, I think. I hate mrt/lrt during rush hourz, very dangerous and spammmyyy peoples…i hate it. the bus i hate, so fast and wreckless, jeepneys too crowdedddd…taxi so expensive…soooo many peoplesszz during rush hour…fck…..